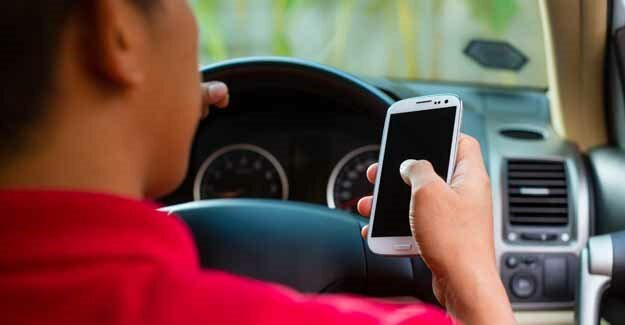 The number of people using a hand-held mobile phone at the wheel seems to be falling. A Department for Transport observational study across Great Britain in 2017 showed that 1.1% of all drivers were holding their mobiles. This compares with a previous study in 2014 covering England and Wales which showed that 1.6% of drivers were using the devices. However, the rate of non compliance in 2017 amongst young drivers was higher with 4% of 17-29 year-olds observed using a handheld mobile. Sixty five percent of these were holding their phones in their hands; the rest had the phones to their ears. Using a hand-held mobile at the wheel has been illegal since December 2003. Since March 2017, motorists caught using a hand-held phone have faced incurring six points on their licence and a £200 fine – up from the previous penalty of three points and £100. In 2017 the use of a mobile phone was recorded as a contributory factor in 33 fatal accidents and 90 serious ones. The same survey showed that in 2017, 96.5% of drivers were using a seatbelt in Great Britain, compared with 95.3% in England and Scotland in 2014. However, as few as 80% of backseat passengers aged 60 and over were seen belted up in 2017. “The headline data suggests that the vast, and increasing, majority of drivers are abiding by the law as it relates to mobiles. But that still means that hundreds of thousands of people aren’t and from what they see on the road many motorists will think the non-compliance rates are actually much higher.